In the early hours of 4 November, nearly 400 floristry students descended on New Covent Garden Flower Market for the 9th Flower Market College Day, sponsored by ECT Travel. What greeted them at this mecca for florists was well worth the early wake-up call: inspirational demonstrations, challenging competitions and, of course, Flower Market Shopping! Anna Day and Ellie Jauncey of the Flower Appreciation Society engaged audiences with their tales from the Flower Market and their lives in floristry. Their demonstration of soft, romantic British flower bouquets caused signed copies of their beautiful book 'The Flower Appreciation Society: An A to Z of All Things Floral' to sell out! If you fancy Christmas Flower Appreciation Society-style, Anna and Ellie are running a Wreath-Making workshop on 8 December in London N1. Check out www.theflowerappreciationsociety.co.uk for details. Meanwhile, in the upstairs demonstration space, the super-creative Alan Simpson, Creative Director of event florist Hybrid waxed lyrical about the joy of foliage. His passion for the Market's Foliage Row and all manner of foliages – from blue pine and contorted willow to umbrella ferns and beyond - was infectious as he performed a true Masterclass in Christmas Wreath-Making. All 300 Level 2 students came together for a sensational Christmas demonstration by Charlotte Slade of world-renowned florists, Jane Packer Flowers compered by the award-winning flower industry blogger, Rona Wheeldon of Flowerona.com. Whilst she created her four stunning festive designs on the Flower Market Stage, Charlotte revealed fascinating insights into the workings of the Jane Packer Flowers business empire and into Charlotte's own career in floristry. Tutors were kept busy too with the Tutors Meeting in the new Capel Manor College Teaching Centre at New Covent Garden Flower Market with presentations by Natalie Revett (Head of Floristry at Capel Manor College), the Flower Market and College Day exhibitors: Smithers Oasis, the BFA, Floral Angels and ECT Travel.By 11.30am the last ever Flower Market College Day to take place in the current building was over. 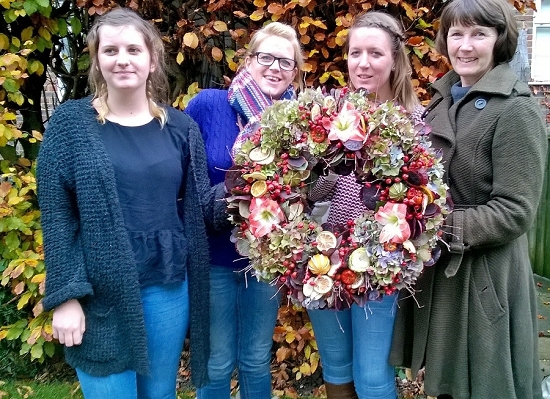 Four hundred inspired but weary students were wending their way home to floristry colleges across the country, knowing considerably more about the UK's premier Flower Market and the working life of the commercial florist than they had done just hours before.